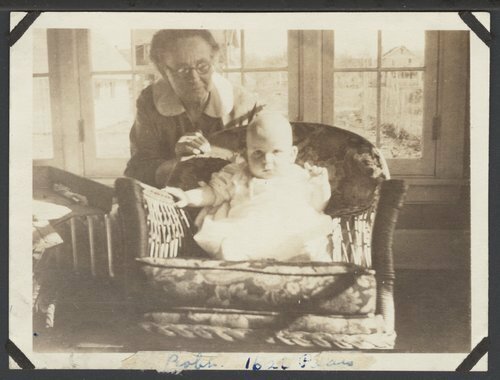 These are candid photographs of Dr. C. F. and Flo Menninger and grandchildren Robert and Julia. Dr. C. F. Menninger, with sons Dr. Will and Dr. Karl, founded the Menninger Clinic, which was the nation's first group psychiatry practice, in 1919, in Topeka, Kansas. Dr. C. F. and Flo Menninger and grandchildren - Mrs. Flo Menninger and grandson Robert.